The importance of an athlete's lower back strength and strength endurance cannot be overstated. Having a strong lower back is critical to injury prevention and performance. However, few programs devote the time necessary to develop it. The lower back and glutes tie the lower and upper body together on the backside of the body. Any weakness in the lower back becomes an 'energy leak' as the power developed by the legs cannot be thoroughly transferred through the core and out through the upper body. Many programs overemphasize Olympic lift variations and neglect the low back, which often limits performance in this lift. To thoroughly develop the low back (as well as the glutes & hamstrings) lifts such as the 45º Back Extension, Romanian Deadlift, Horizontal Back Extension, Reverse Hyperextension, and Good Morning variations should periodically be included in a team's training program. In one of the high-profile Class 6A playoff games, Northwest defeated Topeka, 29-28, when standout lineman Joey Gilbertson sacked Topeka quarterback Corey Thomas for a safety with 3 minutes, 12 seconds left remaining. It marked the first safety for Northwest this season. The Grizzlies, which lead 6A with 52.6 points a contest, had their lowest output of the season and second lowest in the last two years. Northwest, on pace to break the state record for yards per game, still tallied 522 yards but won in a different way. Northwest came back from a 28-14 deficit entering the fourth quarter. The Grizzlies average 556 yards a contest. Running back Jahlyl Rounds rushed 34 times for 177 yards and two scores. Northwest set up the safety with a squib kick that forced Topeka to start at its own 9-yard line. Three straight plays produced negative yards, the last on Gilbertson's winning safety. Gilbertson, who has committed to KU, is more known for his play on the offensive line in the past years. However, this season, he has gone both ways, especially against top opponents. He has 26 tackles and nine for loss this fall, including seven and four TFLs on Friday. Topeka finished its season 5-4. The Grizzlies (6-3) now face top-ranked Derby (9-0) but have an impressive resume with wins against Bishop Carroll and Topeka High along with their elite offense. 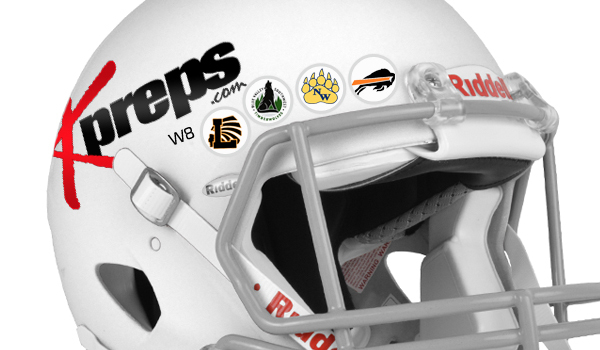 What better way to highlight Logan Marten’s performance on Thursday night then adding an Onaga sticker to the Kpreps helmet. Onaga outscored Valley Falls 114-68 in a game that ended with 1:32 remaining in the fourth quarter due to the 45-point rule. The Buffaloes and Dragons set numerous records on Thursday night including the most combined points in a game with 182. Marten (6-2, 185) rushed for 323 yards and six touchdowns and passed for 334 yards and nine touchdowns in the game! The senior accounted for 15 total touchdowns on the night. He entered this week’s contest with 748 rushing yards and 14 scores. His performance on Thursday pushed his season total to 1,071 rushing yards and 20 touchdowns, while his passing totals increased to 847 passing yards and 13 touchdowns. That means that Marten accounted for 34 percent of his total yards for the season (1,918) and 45 percent of his touchdown totals in his final game on Thursday. Along with Marten, senior receiver Tyler Herrman caught 11 passes for 276 yards and eight touchdowns in the win over Valley Falls. Herrman entered the game with 11 catches all season for 180 yards and one score. Onaga finished just 2-7 in its first season of 8-Man football, but re-wrote the record books in the season finale. Despite a entering Week 9 with a 1-7 record, Blue Valley Southwest went on the road and defeated No. 4 seed Pittsburg, 26-16. Though it was just their second win of the season, the Timberwolves have been competitive all season in the Eastern Kansas League. Five of Blue Valley Southwest’s losses came by less than seven points this season, with their only win coming 30-27 against state-ranked St. Thomas Aquinas. On Friday, the Timberwolves fell behind 7-0 early, but used a controlled, short passing game led by quarterback Will Eldridge to effectively move the ball all night against the Purple Dragon defense. The left-handed sophomore continually hit Cooper Ast, Dylan Pandjaris, and Daniel Foulon on short passes allowing them to move the ball with the effectiveness of a solid ground attack. When the opportunity presented itself Eldridge looked down the field, as he did on a 44-yard touchdown strike to Billy Bartlett in the third quarter to break a 10-10 tie. Eldridge threw touchdown passes to Ast and Bartlett and rushed for a score to lead the T-Wolves. Senior kicker Nathan Gish connected on a pair of field goals to complete the scoring for Southwest. The momentum of the game seemed to shift in the second quarter when Blue Valley Southwest junior linebacker Nick Allen broke through to stop Pittsburg quarterback Chase Curtis’ sneak attempt on 4th-and-goal from the 1-yard line. Blue Valley Southwest, which entered the game with two playoff wins in its history, advances to take on defending Class 5A champion Mill Valley in a rematch of an earlier EKL meeting won by the Jaguars 40-24 back in Week 3. Larned began the season 0-6 against a schedule that included five eventual district champions, and a fifth team that finished as a district runner-up. The Indians won two of their last three games of the season, to qualify for the playoffs. Thursday night, Larned beat a solid Ellsworth squad 42-21. Two of three Ellsworth scores on the night were fumble recoveries for touchdowns in the first four minutes of the game. Larned answered with two rushing touchdowns from Colby Keith, and a Carson Smith touchdown pass to Dalton Bright to make it 21-14 at the half. The Bearcats would tie the game at 21 just after halftime, but Larned would dominate the rest of the way. The Indians scored the final 21 points of the contest and finish as District 15 Runner-Up. Larned will travel to Cimarron (7-2) for a first-round game on Tuesday.